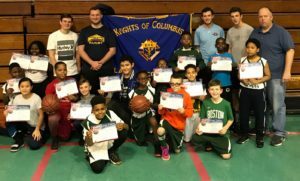 1st Place: AOK (St. Kevin, Flushing/St. Anastasia, Douglaston/Our Lady of the Blessed Sacrament, Bayside/Sacred Heart, Bayside), 402 pts. 2nd Place: St. Sebastian, Woodside, 377 pts. 3rd Place: Tri-M (Our Lady of Mercy, Forest Hills), 273 pts. 1st Place: LIAM (Our Lady of Lourdes, Queens Village/Incarnation, Queens Village/American Martyrs, Bayside/Our Lady of the Snows, North Floral Park), 351 pts. 2nd Place: St. Gregory the Great, Bellerose, 347 pts. 3rd Place: Good Shepherd, Marine Park, 300 pts. 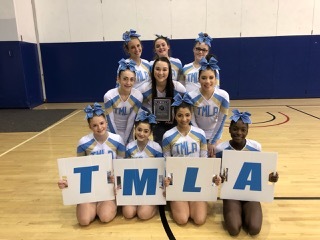 The Mary Louis Academy (TMLA), Jamaica Estates, cheerleading team finished in second place among small varsity programs in the Brooklyn/Queens GCHSAA regional championship, held Jan. 5 at Queens College, Flushing. Made up of 12 student-athletes, the team is new to the GCHSAA scene this season. Their second-place finish was only the second time they have competed in a competition since the team formed. Just a week before competing, injuries to a few key team members cast doubt upon how the Hilltoppers would perform. However, the team rose to the challenge and adapted nicely en route to performing a clean routine. The nine-member competition team successfully performed all of their stunts with no falls, hit their motions hard and kept their technique and competitive spirits throughout the routine. On the big stage, the Hilltoppers made every moment count while making their coaches, parents and school very proud of their accomplishments. The winners advance to the district competition, which will be held in February. The Knights send their gratitude to parish representatives Guy DeFonzo (St. Thomas Aquinas), Bob Clemente (Good Shepherd, Marine Park) and Bob Sommer (St. Columba, Marine Park) for their participation.